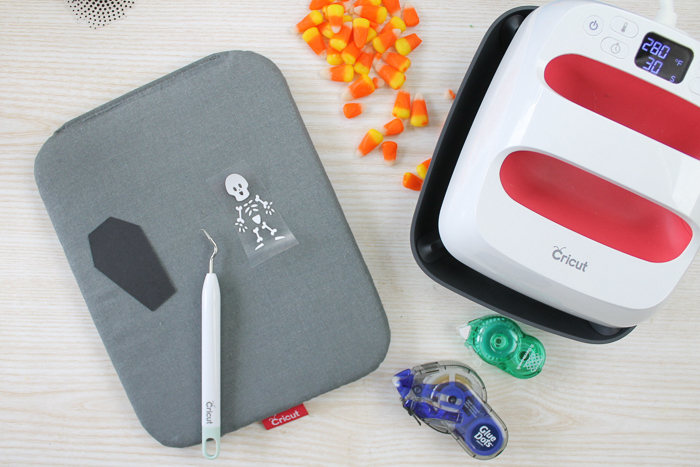 Today we have some Halloween gift ideas that you can make with your Cricut Maker. 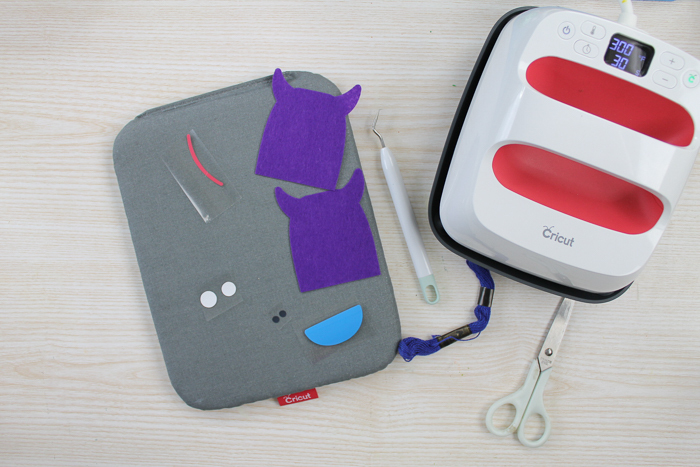 I thought it would be fun to show three Halloween gifts for kids that really show the versatility of the Maker machine. I am actually going to use the fine point, rotary, and knife blade all in this post as well as the scoring wheel. Now that is pushing the machine to the limits! This post is sponsored by Cricut, however, all projects and opinions are my own. Remember that some links in this post may be affiliate links which means that you do not pay anymore, however, a small commission will go to this site. 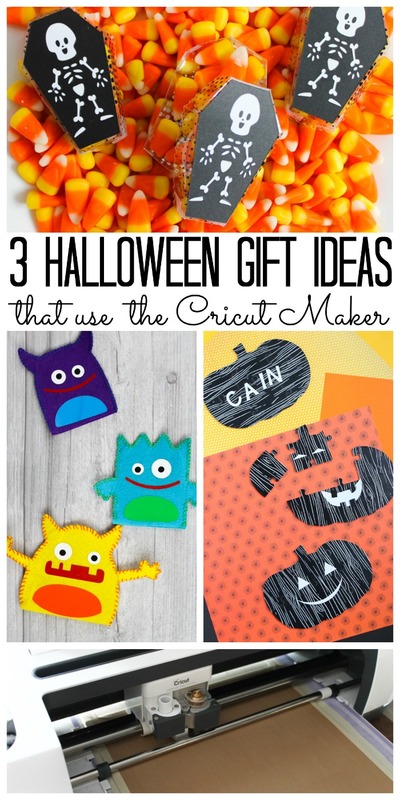 Want to see how I made all three of these Halloween gift ideas in a video? You can watch that below. Can’t watch the video or missed some of the steps? Follow along below. Want to give the gift of candy? 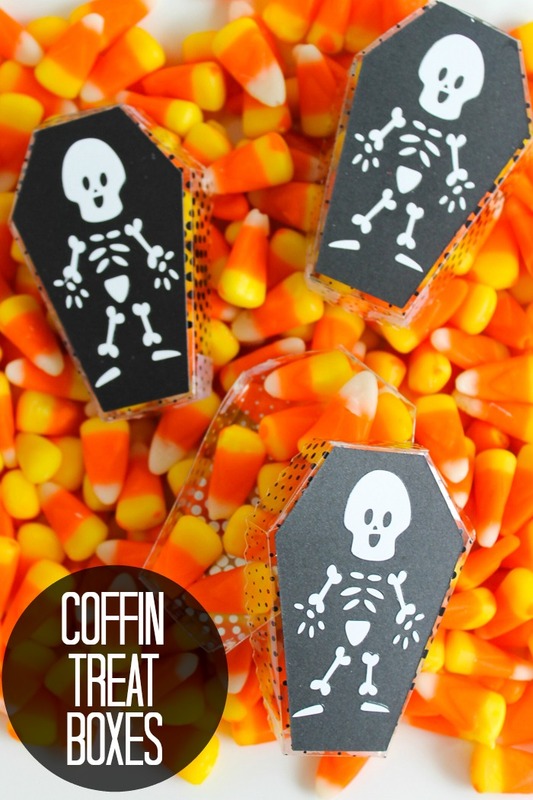 Add it to some fun acetate favor boxes shaped like coffins. The scoring wheel is perfect for scoring acetate. I actually have had no success in scoring it any other way. Start by cutting all of your materials. The foil acetate needs to be cut with the good side down so you can do your folds towards the scoring line. For this, you will follow the instructions on the screen for changing out the scoring wheel for the fine point blade. You will also want to be sure to mirror the cut on the iron-on and cut with the shiny side down. Then weed away all excess from your iron-on including the eyes, nose, and mouth of your skeleton. Weeding tools make this a bit easier but are not required. Add the iron-on to the black coffin shape. 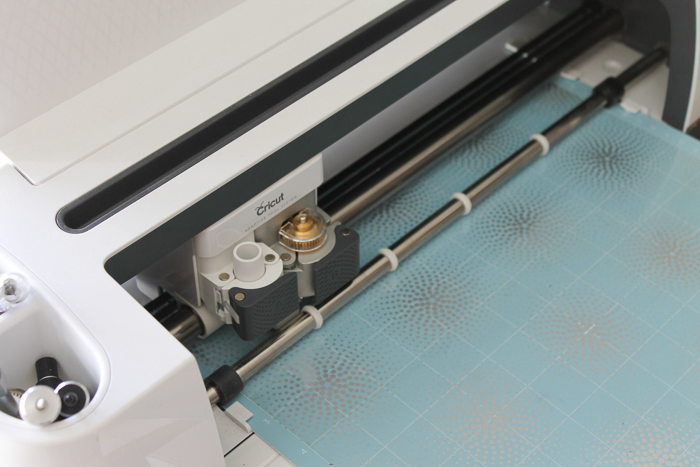 Preheat your cardstock, add the skeleton, and then press according to the recommended settings for the EasyPress. 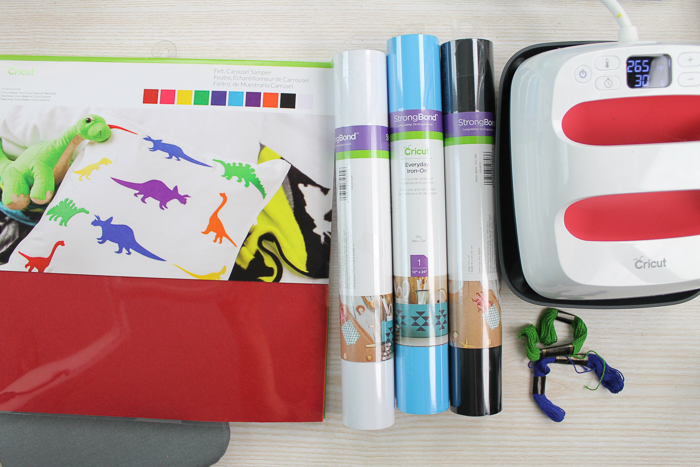 Be sure to protect your cardstock by using either the iron-on protective sheet or some parchment paper. Then fold your acetate coffin boxes. Remove the protective film and fold along all score lines. Then use clear tape or a tape runner to secure the box. 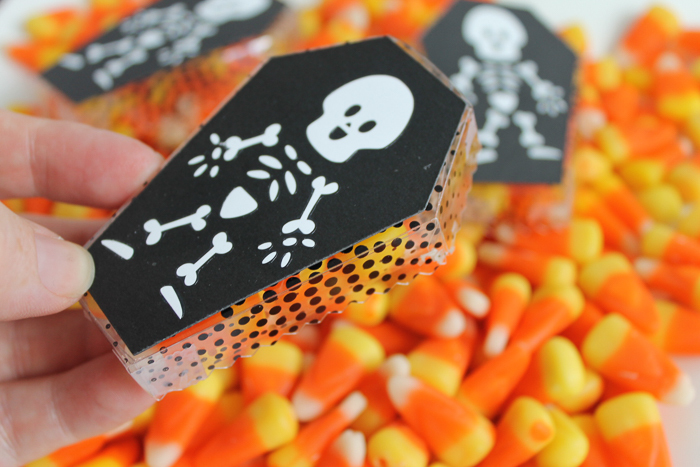 Add the black coffin to the top with more tape then fill with candy! 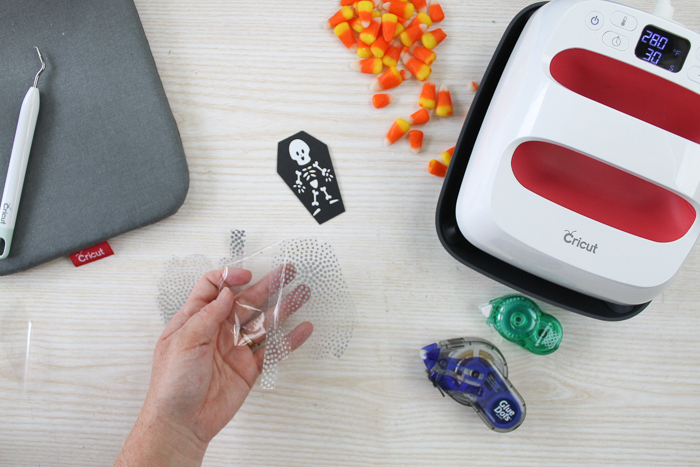 Halloween gift ideas have never been so easy! 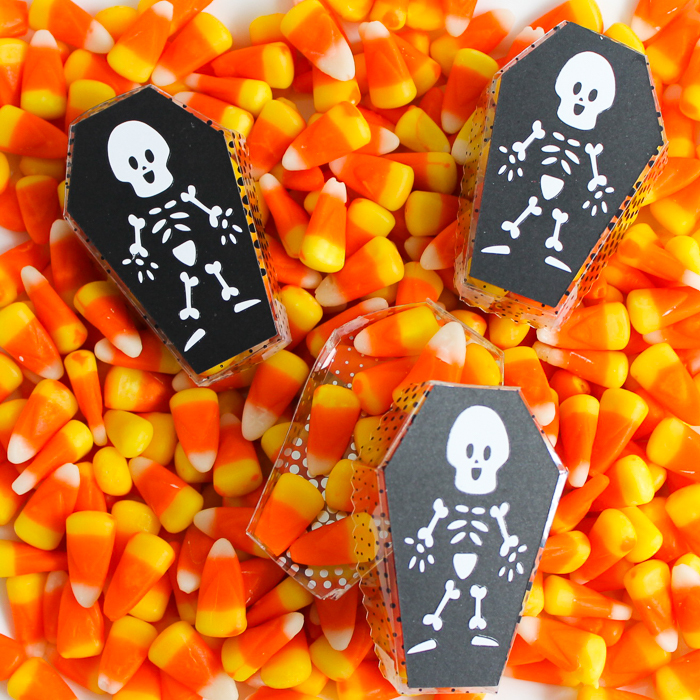 This cute coffin treat box is perfect for any little one. Just lift the lid to enjoy a treat. 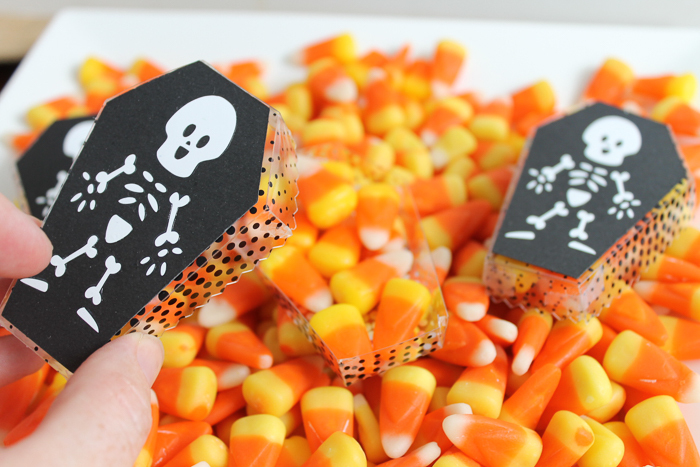 If you need something to gift some candy in this Halloween, consider making these cute acetate favor boxes. They are perfect for those Halloween parties as well. 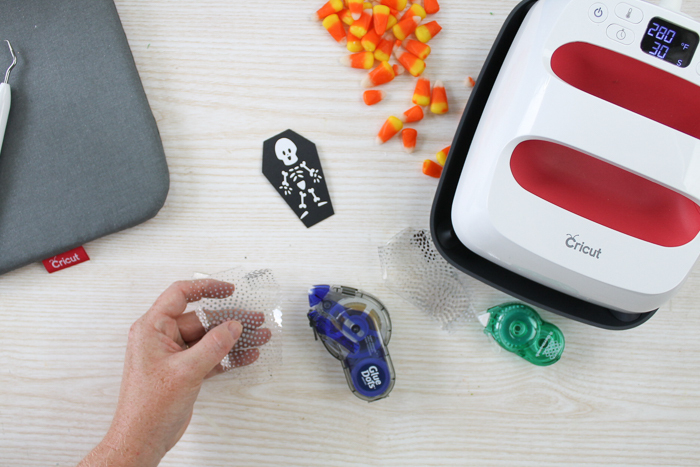 The Cricut Maker makes Halloween gift ideas like these simple with the addition of the scoring wheel. Want to get even more out of your Maker? 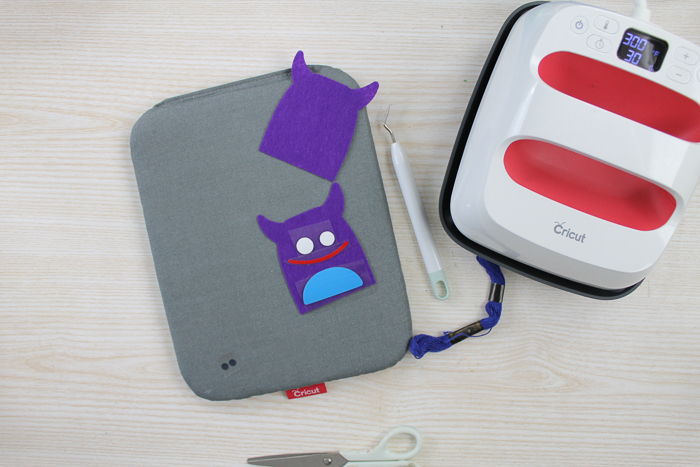 With its expandable suite of tools and Adaptive Tool System, there are so many things you can make. Read on for more ideas. 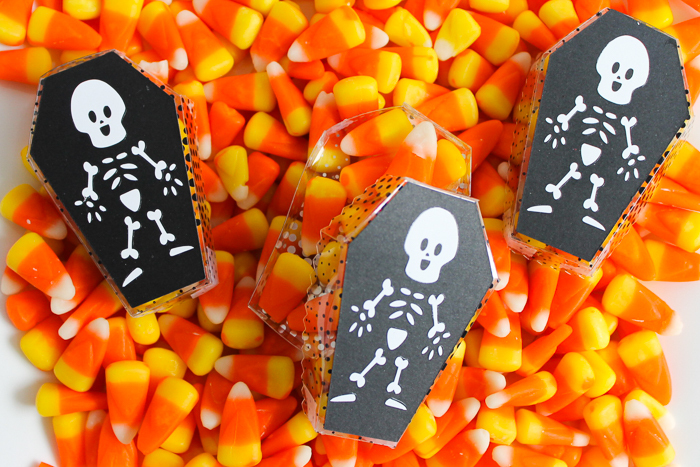 Sometimes you want a non-candy treat for the little ones coming to your door or to give out at a party. If your school has dietary restrictions, something without edible treats is perfect. 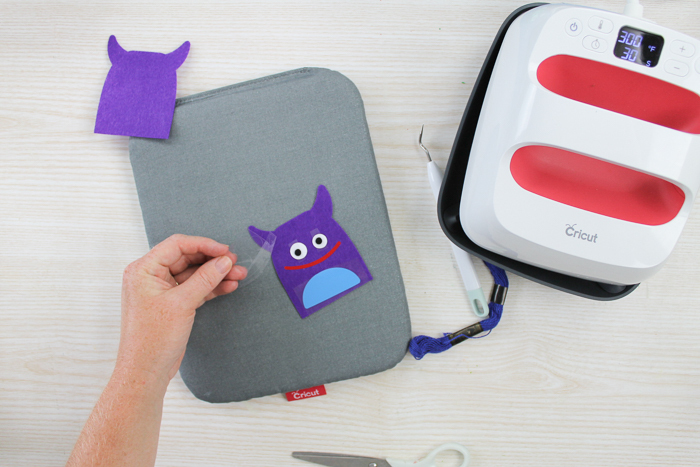 So just use your Cricut Maker to whip up some adorable monster puppets. 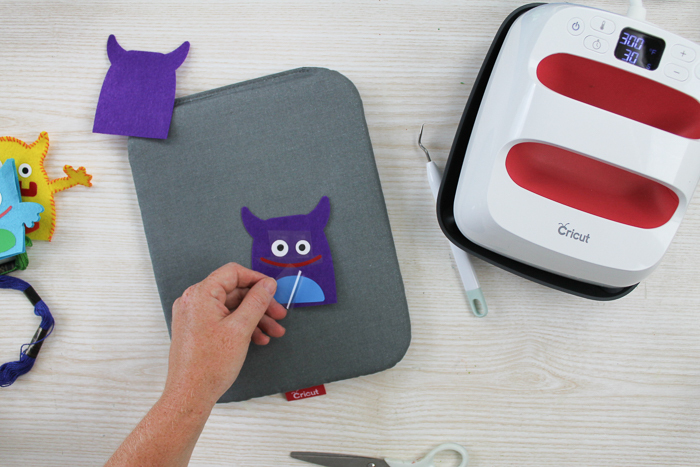 Cut the felt and iron-on with your Cricut Maker. 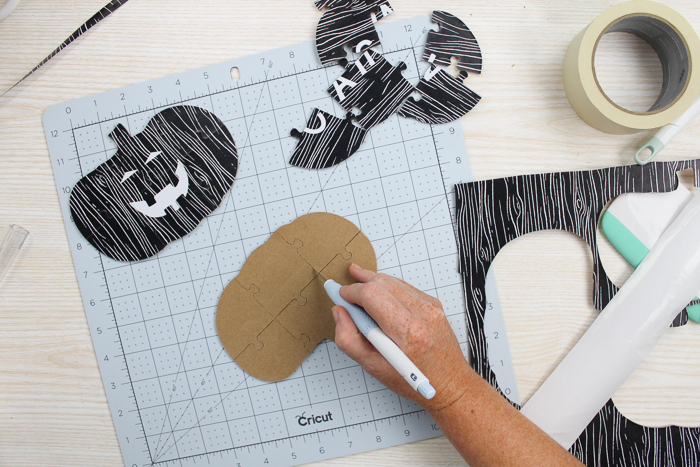 Be sure to edit tools when cutting the felt and choose the rotary blade. The cut is so much better with this blade! 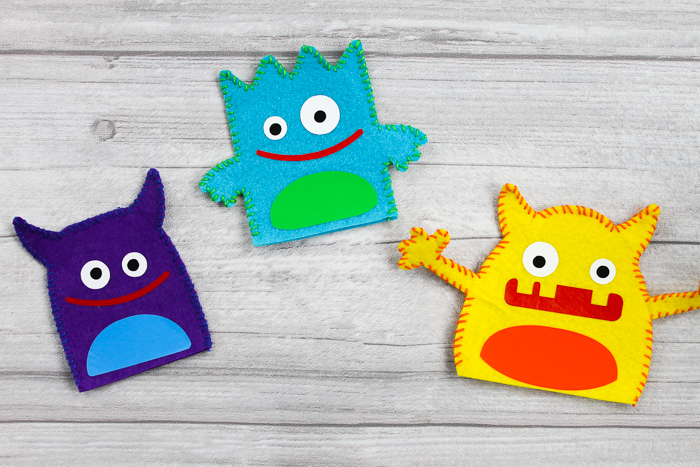 Your felt will look amazing and the cuts will be so smooth. The rotary blade, with its gliding, rolling action, cuts through virtually any fabric from the most delicate to things like denim and burlap. 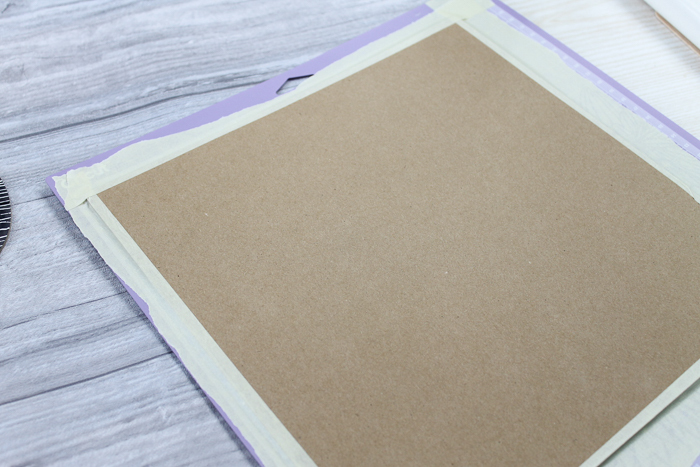 Trim the carrier sheets on your iron-on pieces so that you can press more than one at once. You can press everything in the first press except for the black parts of the eyes. 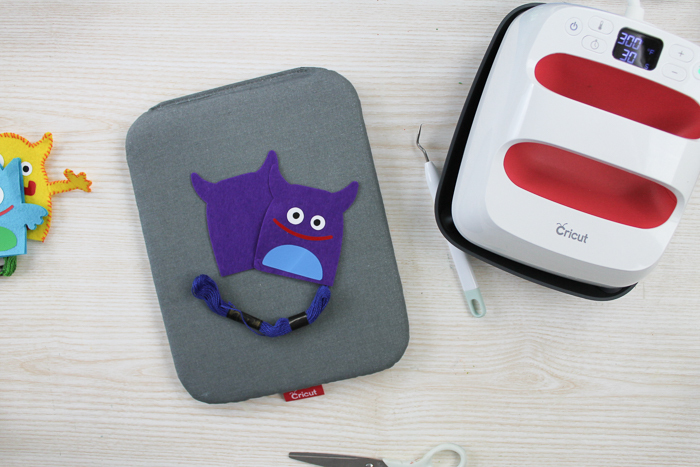 Preheat your felt, add the iron-on pieces, and then press according to the recommended settings for the EasyPress. Stop about 5 seconds before the end of your front press and do not press on the back yet. Peel back just the carrier sheet on the white portion of the eyes and add the black pieces. Replace the carrier sheet over the white to protect your iron-on. Then press on both the front and the back according to the recommended settings. Peel back all of your carrier sheets. Then use embroidery floss and a needle to whip stitch around three sides leaving the bottom open. 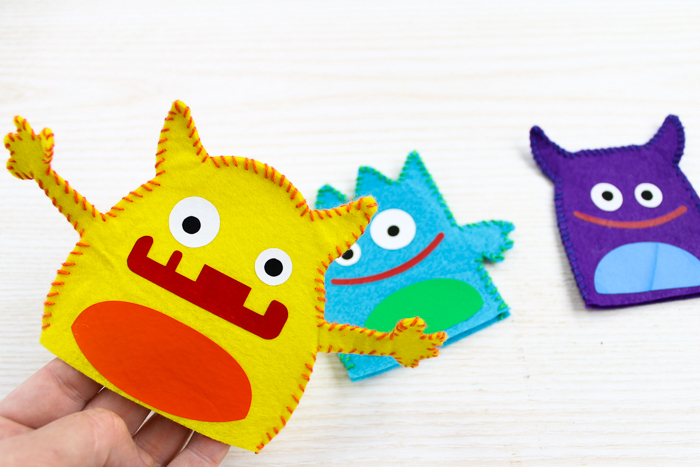 Repeat for as many monster puppets as you need to make for Halloween gifts! 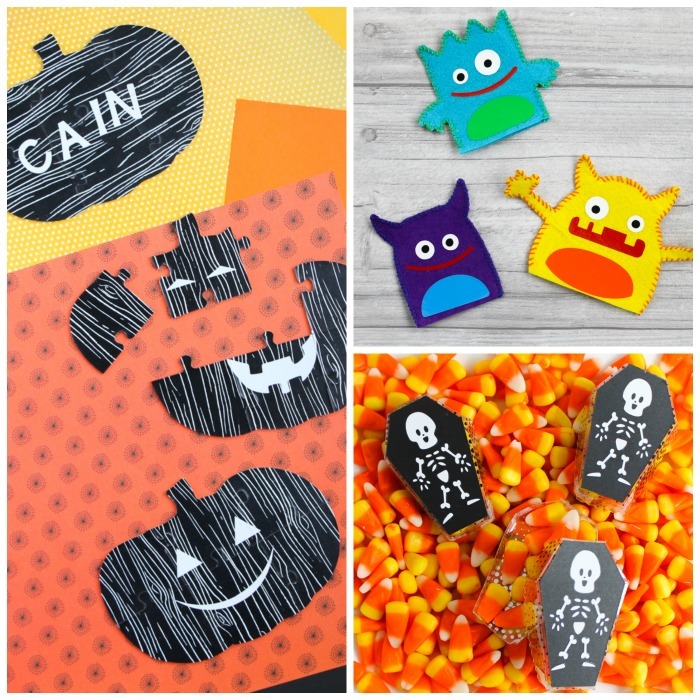 These non-candy Halloween gift ideas are perfect for the little ones. 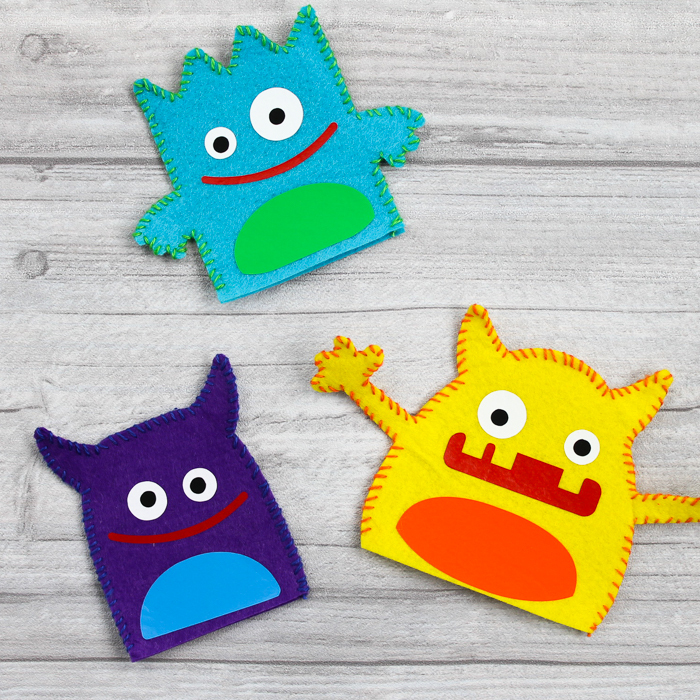 I mean who doesn’t love playing with monsters?? 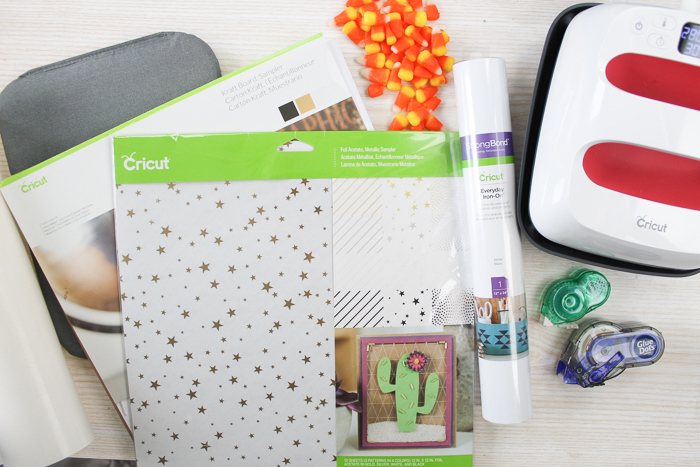 Now we have explored a few of the cutting options that the Cricut Maker offers, it is time to try out another! 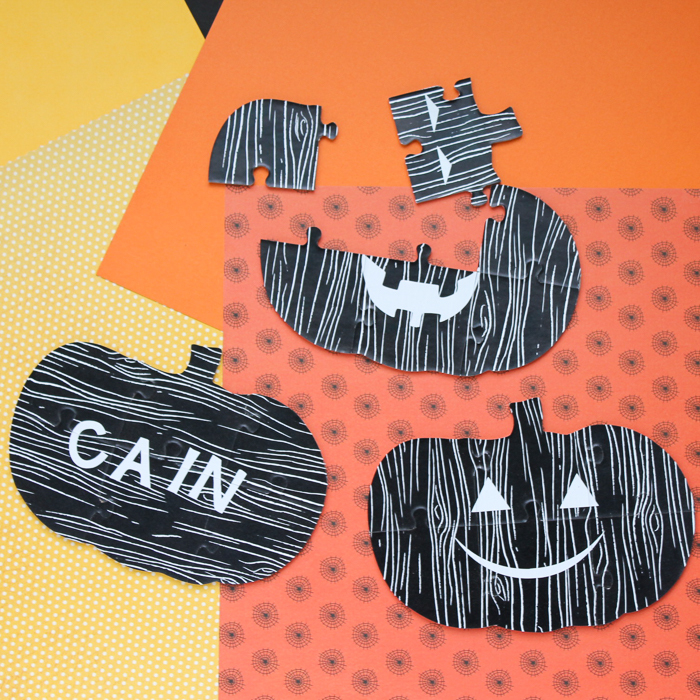 Chipboard puzzles are great Halloween gift ideas and they are easy to make with your Cricut Maker and the knife blade. The knife blade opens up a huge variety of thicker materials and makes projects like this one possible. Combined with the 4 kg of force that the Maker can apply and you have one powerful machine all in the comfort of your own home. 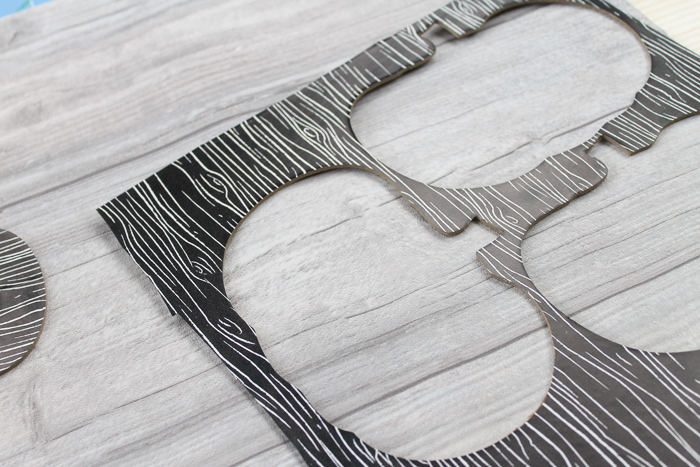 Add the patterned vinyl to one side of the chipboard sheet and press down well with something like the scraper. The chipboard is actually only 11 x 11 while the vinyl is 12 x 12. 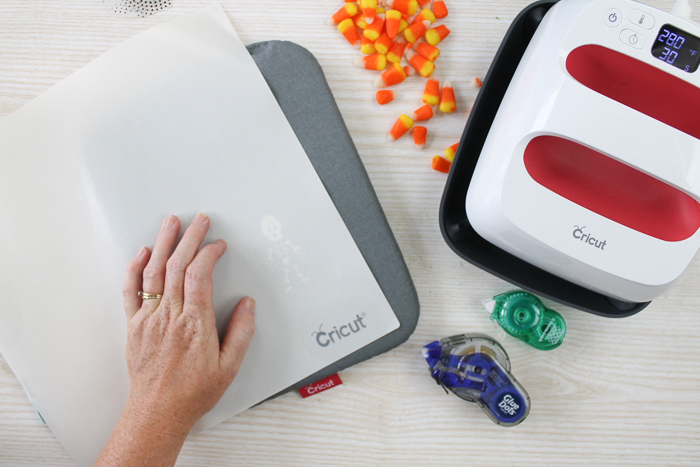 Use the TrueControl knife and self-healing mat to trim away the excess. Then put the chipboard sheet vinyl side DOWN on the strong grip mat. Press down well but do not bray over the top. Then use masking tape to go all the way around the edges and tape into place as shown below. 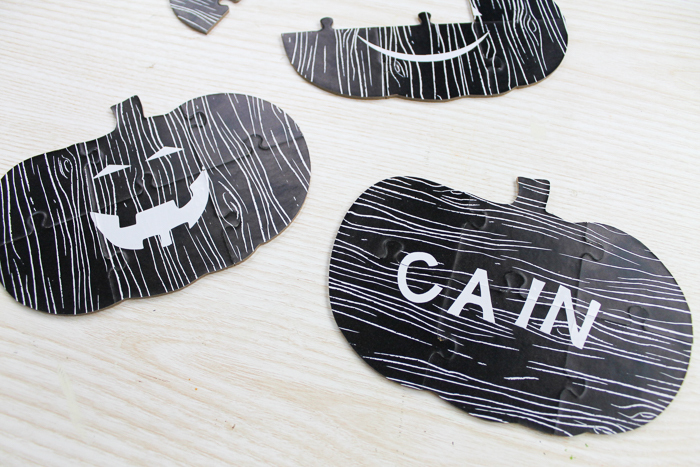 Then cut your puzzles from the chipboard. Remember to move your star wheels on the machine all the way to the right. You can make the puzzles any size you want but the smaller the size the harder it will be for the knife blade to cut them. You can place as many as you would like on the sheet but the more you cut the longer it will take. It took me about 2 1/2 hours to cut three puzzles. You will also want to start checking your cuts about half way through the cut. 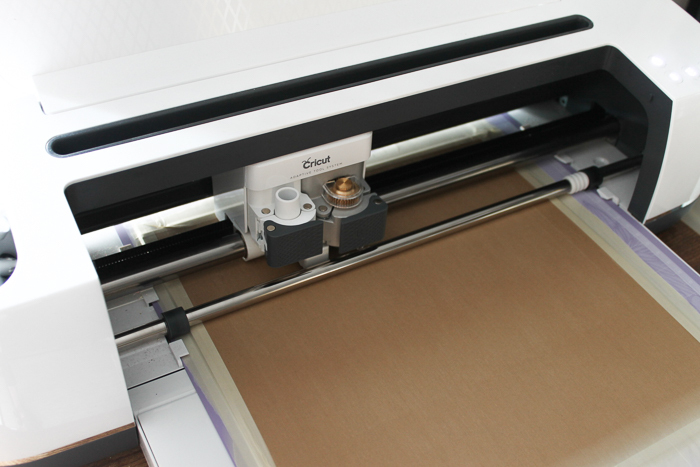 See how to stop the machine and check the cut here. 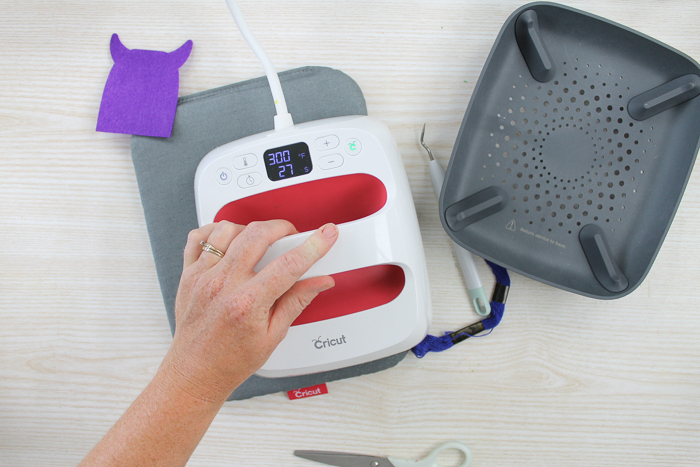 Once most of your cuts are all the way through, you can remove the mat from the Cricut Maker then finish any cuts with your TrueControl knife. You can also let the Maker finish the cuts but be aware that this will shorten the life of your mat. 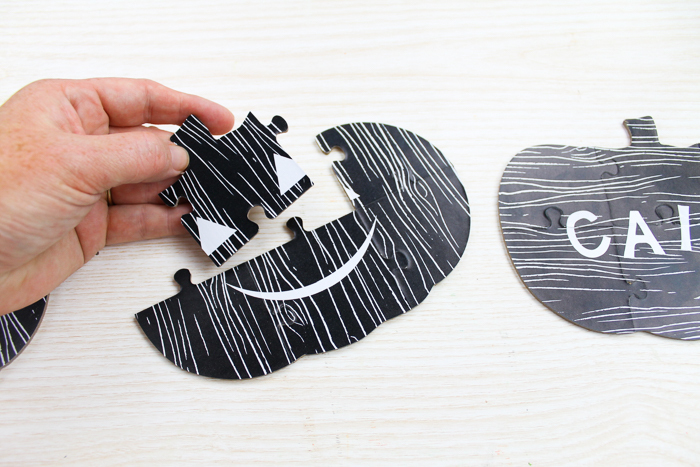 Remove the puzzles completely from the surrounding chipboard and check that all pieces are cut completely through. I thought adding a few fun designs to the front would be cute so I cut a name as well as some pumpkin faces from white vinyl. Then just peel and stick those to the front of the puzzles while they are together. You will want to put the pieces over only straight cut and not those rounded puzzle cuts. Flip the entire puzzle over to the back side and use the TrueControl knife to cut through the vinyl on the front side where the cuts are located. Then just enjoy your fun shaped puzzles and the looks on the kids’ faces when you hand them one. 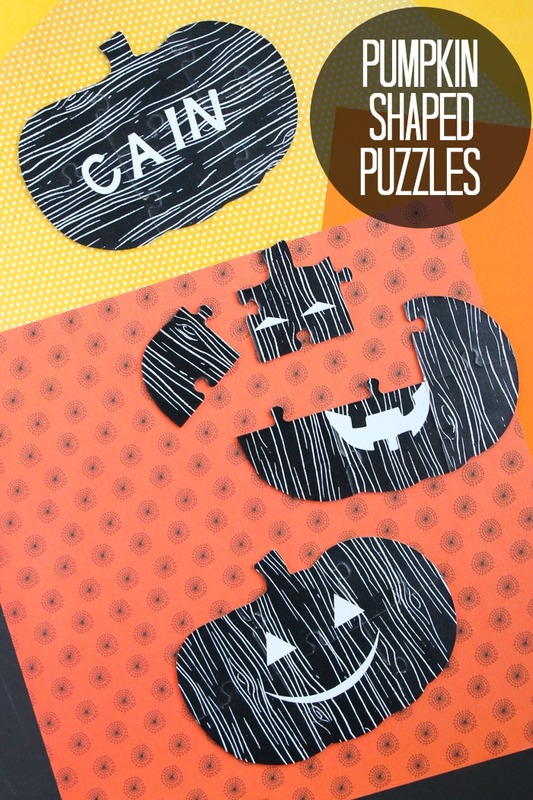 These pumpkin puzzles are great Halloween gift ideas for kids of all ages. 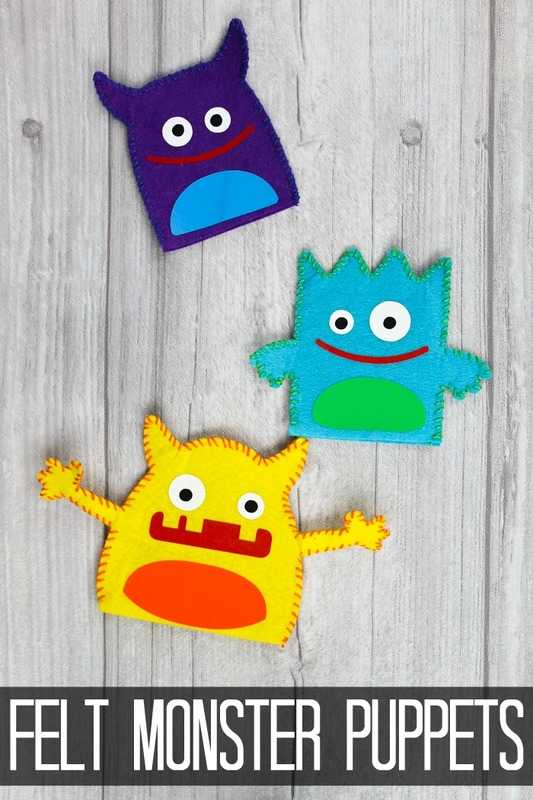 They are also a great example of just what the knife blade and the Cricut Maker can do! 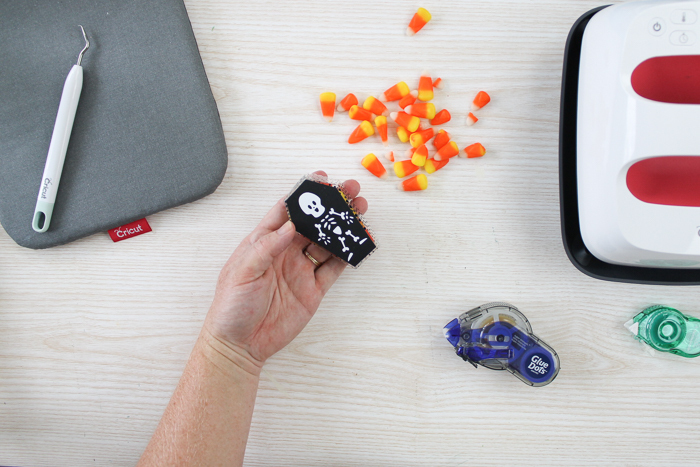 So, which of these Halloween gift ideas is your favorite? Which will you make for a Halloween party that you are hosting? 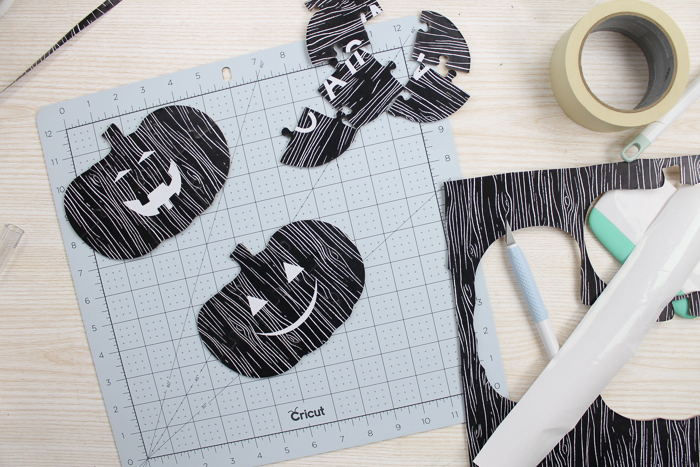 Perhaps you have other Halloween crafts that you are making as well? 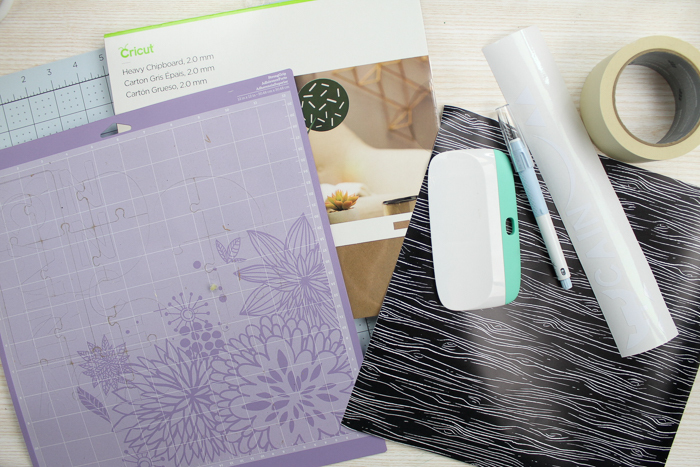 The Cricut Maker is the perfect crafting tool for crafts of all types. It’s professional-level cutting performance, accessible to everyone.